The United States dropped some restrictions Thursday on sales of its advanced drones in order to reinforce the armies of its allies and compete with China on the world arms market. 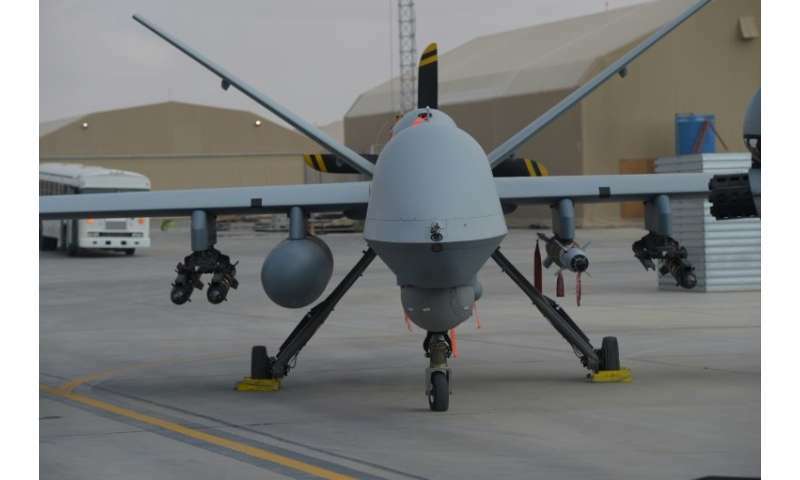 President Donald Trump's White House announced an update to its policy on arms transfers to promote US exports and jobs, and specifically to loosen the rules on selling unmanned warplanes. Trump's chief trade advisor, Peter Navarro, said the move was designed to reverse former president Barack Obama's "myopic" decision to limit even US allies' access to drone technology. Allowing US arms firms to directly market drones instead of forcing foreign customers to apply to the government would, he said, allow them to compete against sales of Chinese "knock-offs." "The administration's UAS export policy will level the playing field by enabling US firms to increase their direct sales to authorized allies and partners," he said, referring to so-called "Unmanned Aerial Systems". Navarro said US weapons and aerospace exports are worth a trillion dollars a year, support 2.5 million well-paid jobs and form a key plank of Trump's ambition to wipe out America's trade deficit. But he said the market for drones alone could grow to $50 billion in a decade and that officials are "seeing Chinese replicas of American UAS technology deployed on the runways in the Middle East." As an example, he cited the Wing Loong 2 medium-altitude, long-endurance drone manufactured by China's Chengdu Aircraft Group. This reconnaissance and missile platform was on display to potential clients at the 2017 Paris Air Show but is, he alleged, "a clear knock-off" of US firm General Atomics' MQ-9 Reaper. "The fact is our allies and partners want to buy American," Navarro said, noting that Trump was putting his "America First" slogan at the heart of arms sales policy. "Partners who procure American weaponry are more capable of fighting alongside us, and are also more capable of protecting themselves with fewer American boots on the ground." The United States pioneered the use of unmanned aircraft, some of them flown by pilots half-a-world away through satellite links to a ground station, for spotting missions and missile strikes. They have been deployed both by the US military in support of overt deployments in the so-called war on terror and by the CIA for covert targeted strikes to kill suspected militants. Critics of their deployment say that, because they can be used without putting American pilots in harm's way, they encourage commanders and presidents to resort more easily to lethal force. Despite the accuracy of missiles guided by drone-mounted lasers, many hundreds and perhaps thousands of civilians have been killed in US strikes in South Asia, the Middle East and the Horn of Africa. But US officials defend the technology, arguing that its proper use allows commanders to study targets more carefully and to carry out precision raids, minimizing the threat to allies and civilians.